for as long as i’ve known G, he’s been going on and on about his mum and aunt’s wonderful stuffed vegetable and tofu recipe. 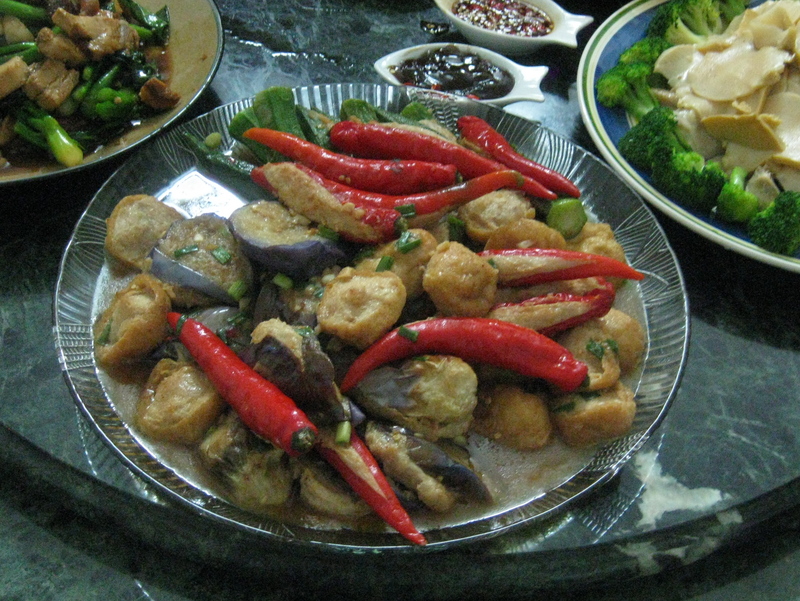 and when i stopped by to celebrate christmas with his family two years ago in kuala lumpur, come supper time, his mom and aunt produced a massive plate filled with stuffed okra, peppers, eggplants and tofu, as pictured above. pretty amazing, no? and yes, i begged for the recipe, but was told that it was strictly a family secret. bummer! that said, i’ve been toying with making stuffed tofu for the past 10 years or so, although it’s usually something i make only for a special occasion…like this past thanksgiving. most stuffed tofu recipes that i’ve seen, fry the stuffed object directly. that technique works well only if using pre-fried tofu (yes, they sell this sort of thing in supermarkets). i prefer to use fresh tofu, which has a tendency to fall apart if fried directly, plus the high water content of the silken tofu really muddles up the frying oil. so, to counteract all this, i steam my tofu first, and then when it’s cold, i fry it in oil. now, this past thanksgiving, about 2 hours before my guests showed up, i finally admitted that my turkey day menu had been a bit too ambitious (i can hear hubs’ “i told you so” refrain in the background), and decided to skip the frying and just serve the tofu steamed. it actually worked out great in retrospect, because steaming enabled me to just plop the entire basket from the steamer directly onto the “buffet” table — no plating required (not that i would have undertaken any fancy plating to begin with) — plus, i was able to serve the dish hot when guests arrived. a few days later, when i found the box filled with leftover steamed stuffed tofu, i decided to fry those babies up. it was like serving an entirely new dish that no one would think was made from leftovers! In the bowl of your food processor, drop in all ingredients. Pulse a few times until just combined. Transfer to a bowl. Cut tofu into roughly 1-inch cubes. 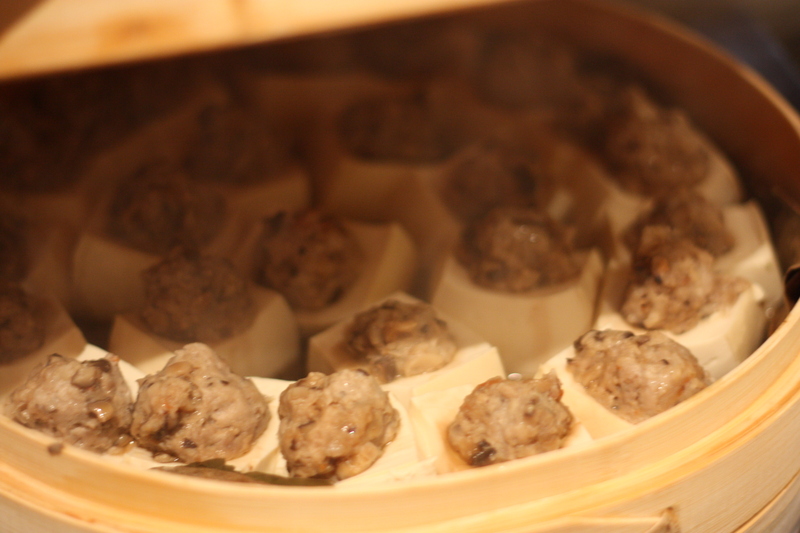 Arrange in a bamboo steam basket lined with lotus leaf or napa cabbage. Use a melon baller to scoop out the center of the tofu. (it’s just a quick twist using the melon baller. you’re leaving most of the tofu intact). Pick up a tablespoon or so of stuffing and roll it into a small ball. Place the ball into the center of the tofu you just scooped out. Repeat until all tofu as been filled. 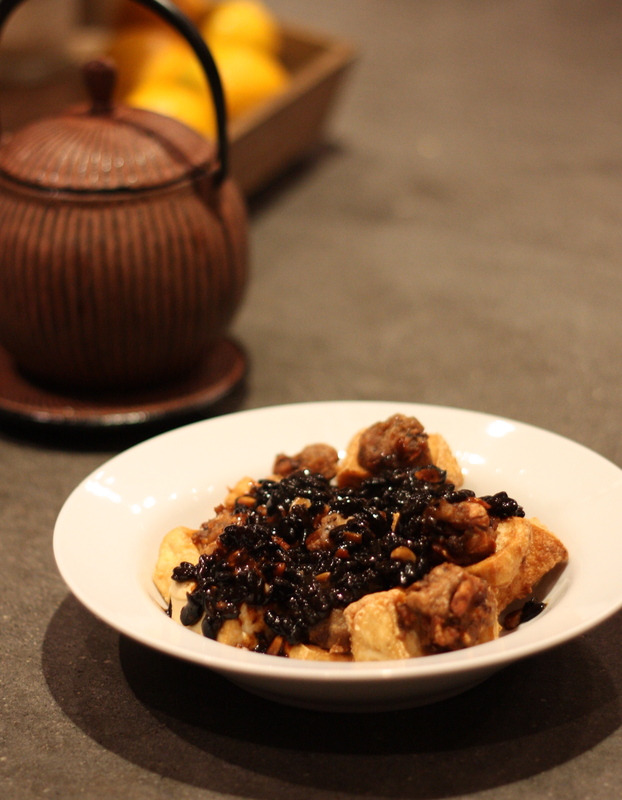 To make the sauce for the steamed tofu, just combine all the ingredients in a small bowl and mix together with a spoon. Serve on the side in a small bowl. To fry the leftover tofu, heat about 2 cups of canola oil in a medium sized saucepan. When the temperature reached 380ºF, drop in one piece of tofu to test if the temperature is right. Then, drop in a few more. The temperature will dip each time you introduce a new piece of tofu, so only fry a few at a time. To make the sauce for the fried tofu, heat about 1 tbsp of canola oil in a pan. Drop in ginger and shallots and fry until golden brown. While the shallots of browning, dissolve cornstarch into the chicken stock. When the shallots have lightly browned, pour in shaoxing wine, followed by chicken stock/corn starch and oyster sauce. Reduce until thickened to the consistency of gravy. Then, pour over fried tofu. [Note: in the picture above, I ran out of shallots and ginger, and substituted with black beans. Personally, I prefer the shallots and ginger more]. when it comes to chinese sweets, egg tarts are about as common as they come and have since proliferated into infinite styles, schools and flavors. there are the macau style egg tarts, green tea egg tarts, melon, strawberry, puff pastry, shortbread, shiny and perfect, rustic and browned (like mine), super sized egg tarts, deep dish ones, mini egg tarts, egg white egg tarts, so on and so forth. when they are made well, they are scrumptious! a flakey or crispy crust (depending on the school) filled with a rich egg custard. cheap too! the typical egg tart in NYC chinatown will run you about $0.60 – $0.70 cents. as a self-proclaimed egg tart aficionado, i’ve been trying to re-create the egg tart at home. the baked egg custard filling is a breeze to throw together — i found a great recipe from chef chan at the celestial court restaurant in hong kong. i’ve used it to fill classic egg tart shells (pictured above) and i’ve even poured it into a nine-inch pate sucree tart shell to make a mega sized egg tart. chef chan’s egg custard is in the classic style. 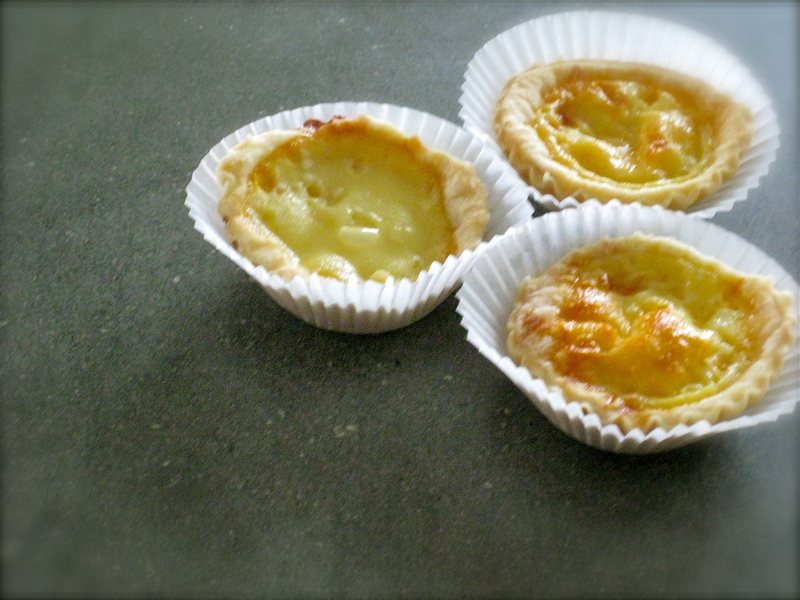 the macau style egg tarts use heavy cream in addition to milk to produce a yet richer egg custard. now re-constructing the classic puff pastry egg tart shell has proven to be much more of a challenge. i’ve attempted about 3 times already in the past year without much success. i realised on my latest attempt that my problem stems from the substitution of shortening for lard. shortening is too soft and oozes all over the place no matter how careful i am when folding the dough. i haven’t as yet located lard in the grocery stores near me. i may have to trek up to chelsea market to procure it. but for now, i’ve resorted to using pate sucree, pate brisee (in the picture above) or puff pastry dough to form the tart shell. Stir together milk and sugar until the sugar has dissolved. Stir in the eggs using a whisk until the mixture is consistent. Pour the mixture into prepared tart shells* until 80% full. Bake for 10-20 minutes at 350ºF until set. [nb: baking time should be adjusted to ~30 minutes for a nine-inch egg tart] The egg custard in the classic egg tart is an unblemished yellow after it has set. I tend to like my egg custard a little bit browned, following the macau style. * when using traditional chinese puff pastry, the egg custard batter is poured directly into the chilled raw tart shells. when using french tart dough substitutes, i prefer to blind bake my tarts for 10 minutes first, allow them to cool and then pour in the egg custard. i find that blind baking makes the tart crust crispier. for pate sucree, i will also brush on some egg whites in the last 5 minutes of the blind baking step so as to waterproof the tart shell for the egg custard batter. 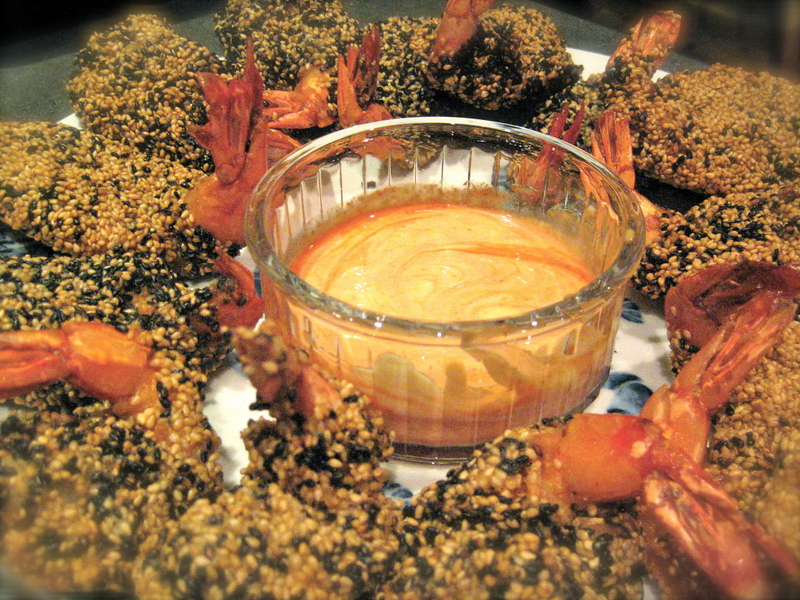 i made sesame shrimp for thanksgiving and my mom even asked me for the recipe. you can prep them in advance and freeze them for up to a month. just drop them into some hot oil when your guests arrive and you’ll have some happy stomachs. Wash and dry shrimp. Using a knife, cut down the back of each shrimp, leaving the tail attached. Put 1 cup of flour in a bowl. Put sesame seeds in a separate bowl. Set aside. In a third bowl, mix together sesame oil, wine, eggs, cornstarch, baking soda, 1/2 cup of canola oil, water, and remaining 1/2 cup flour. This is your batter. Dip each piece of shrimp in the flour first, then the batter (from step 3), and finally the sesame. The coated shrimps at this point can either be frozen (by separating each layer of shrimp with parchment paper or plastic) until ready to fry, or fried immediately. To fry, heat a saucepan filled half-way with canola oil until it reached 360ºF. Put 1 shrimp in first to test and then work with a batch of 2 to 3 at a time. The shrimps are cooked when crispy and deep brown, about 2 to 3 minutes. I served the shrimp with a spicy mayo sauce.